Nasturtiums (Tropaeolum majus) – Comes in varieties ranging from trailing to upright and in brilliant sunset colors with peppery flavors. Nasturtiums rank among most common edible flowers. Blossoms have a sweet,spicy flavor similar to watercress. Stuff whole flowers with savory mousse. Leaves add peppery tang to salads. Pickled seed pods are less expensive substitute for capers. 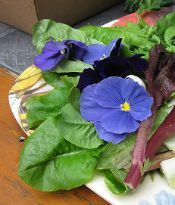 Use entire flowers to garnish platters, salads, cheese tortas, open-faced sandwiches, and savory appetizers. Anise Hyssop (Agastache foeniculum) -Both flowers and leaves have a delicate anise or licorice flavor. Some people say the flavor reminds them of root beer. The blossoms make attractive plate garnishes and are often used in Chinese-style dishes. Excellent in salads. Basil (Ocimum basilicum) – Depending on the type, the flowers are either bright white, pale pink, or a delicate lavender. 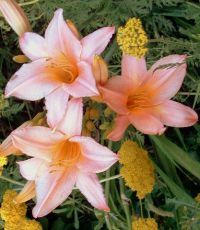 The flavor of the flower is milder, but similar to the leaves of the same plant. Basil also has different varieties that have different milder flavors like lemon and mint. Sprinkle them over salad or pasta for a concentrated flavor and a spark of color thatgives any dish a fresh, festive look. Burnet (Sanquisorba minor) – The taste usually is likened to that of cucumbers, and burnet can be used interchangeably with borage. Rosemary – Milder version of leaf. 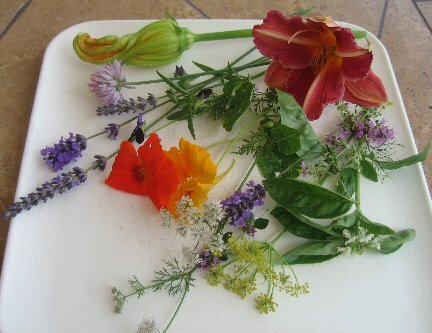 Fresh or dried herb and blossoms enhance flavor of Mediterranean dishes. Use with meats, seafoods, sorbets or dressings. Radish Flowers (Raphanus sativus) – Depending on the variety, flowers may be pink, white or yellow, and will have a distinctive, spicy bite (has a radish flavor). Best used in salads. The Radish shoots with their bright red or white tender stalks are very tasty and are great sauted or in salads.